Timeline will put all of your activity and updates into one place on your Facebook profile. At first, I thought it was a neat idea to be able to chronicle your life with photos and status updates. You can go back to any year of your life and fill in your timeline with events that you may not have documented. Then, I thought about the early adopters of Facebook, like myself, who joined the platform way back when it was only open to college students. 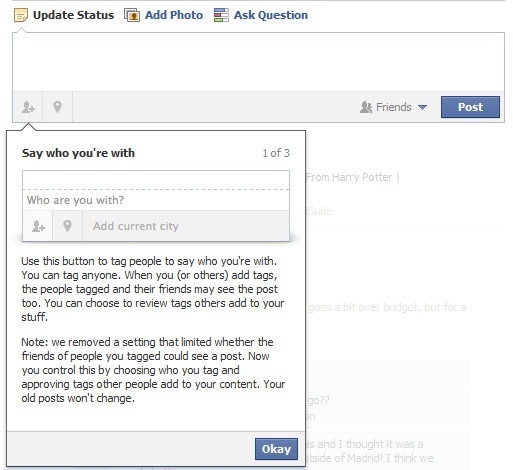 Facebook also announced the ability to integrate apps into a Timeline. The apps allow users to see what music their friends are listening to via Spotify, or what TV show they are watching via Netflix. With recruiters and HR managers using social media platforms like Facebook to peek into prospective job candidates’ lives, many users scramble to hide status updates or bury old photos. I wonder how Timeline will impact job seekers, or even professionals in the workplace. Maybe some people prefer to leave photos and status updates in the past. 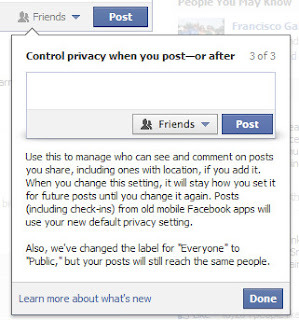 I’m anxious to see how Facebook will handle the privacy matters surrounding this new feature. One user commented on the announcement that the change could create a spike in identity theft and that it seems to be reminiscent of the book, A Brave New World. All of these updates will have implications for how users interact on the platform. What do you think? More importantly, will this have implications for companies who use Facebook in a business capacity? Every minute… every hour… your inbox grows! Despite you best endeavors; no matter how many times you check your blackberry or iPhone … it keeps on coming! Email is an essential part of our daily communications with other attorneys in the firm, paralegals, support staff and our clients. To increase your productivity and avoid wasting billable hours, try these quick strategies for email filing and avoid the guilt factor of a huge inbox! Set up folders to file important information – establish a folder for every case, client or project you are working on. Once you have read or actioned the email, determine where it should be filed so you can quickly access it in future. Color code your incoming email – learn how to change the color of incoming email so you can look at your screen and quickly identify important emails. You can allocate a color for your managing partners, supervisor, clients, staff and colleagues so you know which emails to action first. Establish rules for incoming email – there are options in email software to manage all incoming emails. If you receive spam, set up a rule for the incoming email address to automatically be sent to your deleted items. You can set up rules for newsletters you subscribe to and automatically file in a folder to read later. This helps you manage your inbox to prevent a feeling of overload from the number of emails you receive each day. Read and delete – if you do not require the email for future reference, once actioned – delete it. Don’t allow emails to stay on your inbox screen – it will only make you feel like you have more work than necessary. Be disciplined and file in a folder or delete. Regularly clean out email – you use a lot of firm server space with email, each month empty your deleted items. By doing this regularly it will help manage your email. Spend 15 minutes – invest 15 minutes every week to filing your actioned or reference email. Completing this important task each week will ensure your inbox will only list those emails requiring your action. 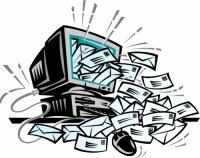 Email filing is an important part of our daily workload - don’t let it get out of hand. Choose to boost your productivity by allocating time to reduce your inbox and feel a sense of achievement once it is completed. Neen James, MBA CSP, is the President/CEO of Neen James Communications, LLC. An international productivity expert and native born Aussie, Neen delivers engaging keynotes that have educated, and entertained audiences with real-world strategies that apply in all roles, whether at work or in life. Neen also provides one-on-one consulting and mentoring to women on a variety of business issues and topics. To find out more about Neen, visit her at http://www.neenjames.com/. Tuesday’s NAWBO event at the Merion Cricket Club in Haverford brought together women small business owners, public relations professionals and local media professionals from around the Philadelphia-area region. The event titled “How to Get Press for Your Small Business” was very informative with media professionals from radio, newspapers, magazines and TV were in attendance. Craig Ey shared that the Philadelphia Business Journal reporters often get swamped by email and it’s refreshing to get a pitch via telephone. A great way to be quoted in the paper is to find a trending news topic and tie your expertise into the story. The best time to send a press release for an event is one week in advance. Debbie Goetz notes that it’s important to find a pitch angle or hook to tie in current events or local ties for the media. The news must answer the question, why should I care? Jeanine Clingenpeel encouraged small business owners to provide content to SmartCEO out of the “Spirit of Giving” meaning that the information in an article should be a useful resource to the readers. Experts should give back of their knowledge and share information that will resonate with the audience. Articles should be written to display thought leadership and the writers need to know the magazine’s niche audience. She encouraged the event attendees to read the magazine and know the audience it serves. Brad Segall loves unusual, quirky and bizarre stories for the radio. He talked about the morning drive prime time on the radio and how it’s a popular time for news because motorists listen to KYW on their commute to work. Key stories that catch his eye are the ones that can help make a change or how to do something in a better way. At some point, when you pitch him a story, he is going to get you or your client on the phone to gauge how well you come across. Autumn Marisa discussed putting a personal touch on an email to her, but remembering to keep it concise and to the point. She suggested following her on Twitter. Many don’t realize that Tango Traffic is a 24-hour traffic channel and Autumn shared that during a 4-hour show, the hosts need things to talk about. Make sure your news is timely and different. Emotional news that will make people angry or feel good can help to determine if the story will interest the media. She also said that senior citizens and pets are always good visual topics. Lastly, Karen Hepp noted that experts on the news need to be good at TV – speak in short sound bites, know their material and be confident. She emphasized the need to personalize a pitch to an individual reporter. All in all, the event was very successful and helped to give some good tips on media pitching and the best ways to get the attention of the media. To get started, do some intial earn a reporter’s beat or discover who the publication caters to and begin to cultivate a personal relationship. I was secretly delighted to hear some people are limiting their access to email (but that is a topic for another blog)! Here are strategies you can communicate with influence without using email as your primary tool … each of these will take you no more than 15 minutes (now that’s productive!). We are all responsible for practice development and if you want to grow your book of business for the firm try a few of these ideas. Send a hand written note – no one does this anymore and because we have so much electronic communication they will appreciate a ‘personal touch’. Send a magazine subscription – for usually less than $20 you could include a note: ‘I know you don’t have time to read all your emails but thought you might have a few minutes to enjoy a magazine… would like a chance to connect and share with your what our firm could do for you’. Send a postcard – hand write a message on the back… same idea as the hand written note but it stands out in people’s mail each day. I like to send Aussie postcards with scenes and phrases that make people smile (it helps I am Australian). What is memorable about you and your firm that could also be shown on a post card? Send a parcel – everyone loves presents! It could contain a recommended book, journal or sample of your product. Include a note suggesting you get together by phone to chat about the book/journal/sample. I once sent a jar of peanut butter and jelly to the director of very large cable company with a note ‘I know you don’t have time for lunch but maybe a quick PBJ sandwich?’ (I don’t even eat PBJ – that is definitely an American institution… I found out that was his favorite sandwich). That jar led to many fabulous opportunities, great relationships and a very profitable client. 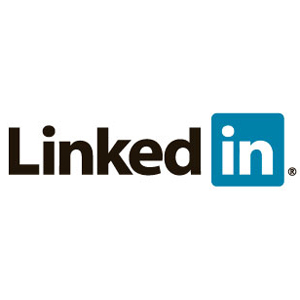 Send a LinkedIn request – OK so this one does appear in their inbox… however… people take notice of invitations to connect and often take a moment to read your bio. Invite them to a networking event – phone and offer to host them, introduce them to others they would benefit from knowing and connect at the same time – very productive! Text them – no… you don’t have to be up on the latest text talk (e.g. LOL, BRR) however you can quickly and easily ask if they have time tomorrow to chat by phone. Not many people use text wisely for connecting, it is personal, quick and usually gets a response. 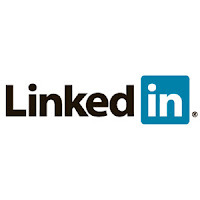 Search social media profiles – you can direct message on Twitter or send a Facebook message. These are alternative communication strategies and will appeal to different clients. Create a video – create a 30 second invitation to connect with you (you can do this on your iPad using iMovie … or the camera in your laptop), upload to YouTube and send a link inviting them to coffee (these videos can also be texted). OK I admit this is another email… however you have to admit it is a creative one! Note: You might want to also make sure this is OK according to your firm’s social media policy. Your prospects and current clients do want to hear from you – you just need to get clever, cut through the clutter, be creative and do this more productively – now it only takes 15 minutes – which strategy will you try first? Neen James, MBA CSP, is the President/CEO of Neen James Communications, LLC. An international productivity expert and native born Aussie, Neen delivers engaging keynotes that have educated, and entertained audiences with real-world strategies that apply in all roles, whether at work or in life. Neen also provides one-on-one consulting and mentoring to women on a variety of business issues and topics. To find out more about Neen, visit her at www.neenjames.com/bio. Facebook has rolled out some new sharing options this week— users can now tag where they are and who they’re with, as well as manage sharing settings from the status updates box. The most interesting change is that users can change who sees a status update, photo or profile information at the time of sharing or afterwards. 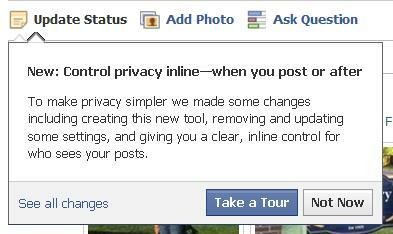 Apparently, Facebook has made the privacy settings page more simplified. Many are saying the changes to the social networking platform were done to set the platform up as a more viable competitor with Google + and its more flexible sharing options. Users don’t need to be friends with someone to tag them in a post. 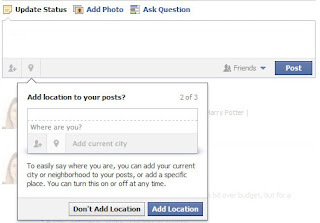 From any computer, users can tag themselves at any location around the world. 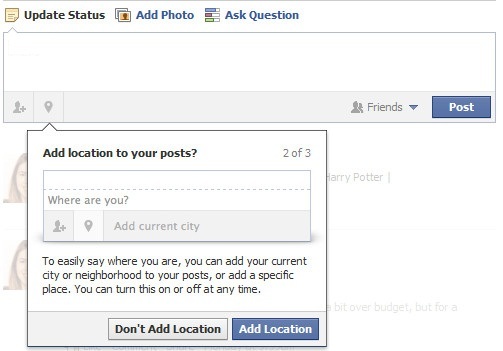 Facebook’s mobile app, however, utilizes the phone’s GPS to claim any check-in deals offered by businesses. To see more screen captures of the changes photos, check out this Mashable.com article.